The objective of this study was to screen wild and domesticated tomatoes for resistance to Tomato yellow leaf curl virus, Israel (TYLCV-Is) and Tomato leaf curl virus from Bangalore isolate 4, India (ToLCV-[Ban4]) to find sources of resistance to both viruses. A total of 34 tomato genotypes resistant/tolerant to TYLCV-Is were screened for resistance to ToLCV-[Ban4] under glasshouse and field conditions at the University of Agricultural Sciences, Bangalore, India. Resistance was assessed by criteria like disease incidence, symptom severity and squash-blot hybridization. All the tomato genotypes inoculated with ToLCV-[Ban4] by the whitefly vector Bemisia tabaci (Gennadius) produced disease symptoms. In some plants of the lines 902 and 910, however, the virus was not detected by hybridization. 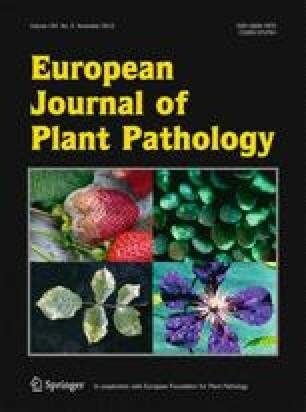 The tomato genotypes susceptible to ToLCV-[Ban4] by whitefly-mediated inoculation were also found susceptible to the virus under field conditions. However, there were substantial differences between genotypes in disease incidence, spread, symptom severity and crop yield. Despite early disease incidence, many genotypes produced substantially higher yields than the local hybrid, Avinash-2. Sixteen tomato genotypes from India resistant/tolerant to ToLCV-[Ban4] were also tested for TYLCV-Is resistance at the Hebrew University of Jerusalem, Rehovot, Israel. Accessions of wild species, Lycopersicon hirsutum LA 1777 and PI 390659 were the best sources of resistance to both viruses. Lines 902 and 910, which were, resistant to TYLCV-Is were only tolerant to ToLCV-[Ban4] and accession Lycopersicon peruvianum CMV Sel. INRA, resistant to ToLCV-[Ban4], was only tolerant to TYLCV-Is. Implications of using the resistant lines in breeding programme is discussed.